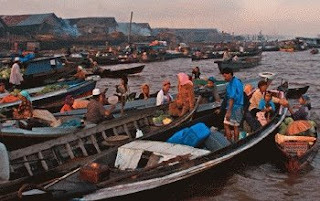 Muara Kuin on the Barito River, Banjarmasin is one of two floating markets in this planet. There a lot more to see in the region, among them diamond mining and polishing villages at Cempaka. To experience Banjarmasin you must take to the river, either by “klotok“ (river bus), or a speedboat for longer trips.